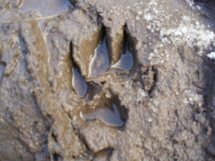 There are two different types of tracking enjoyed by scouts: reading the tracks of animals and people who don't know they are being followed and leaving and/or following the tracks that are left behind to show a route. It can be important to be able to leave an explicit track that others can follow, and it is an enjoyable skill both to leave and to follow tracking signs. If you are forced to set out on your own, for instance, it might save your life. If something were to happen to you and you weren't able to make it to your destination someone could follow your trail and eventually find you. Below are some of the more common signs used in scouting. The first four are the most commonly used ones, and can be made out of anything available including piles of pebbles, sticks, or even by tying the tops of long grass together and pointing the end in the required direction. The X sign is useful as it is a simple sign which can quickly show the path that wasn't taken at a fork in the road, for instance. The final one, Gone Home, marks the end of the trail. The second row are some of the fancier signs, showing that have left a message for your trackers, that your party had to split up, that you might have to cross a fallen tree, for instance, or go over water (or just that water is nearby in particularly arid places such as deserts). 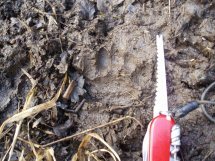 As well as tracks left intentionally by your fellow scouts and cubs, most animals (including man) leave tracks that can be read and/or followed if you know how and where to look. Trying to understand the habits of animals turns every walk into a discovery. These skills of looking, seeing and thinking can help you become involved in and enjoy the countryside that you walk in and possibly prevent errors when walking or camping. Walk very slowly and very quietly. Don’t walk far but away from crowds or early or late in the day. Don’t plan to Track for more than an hour, it is mentally tiring. It is not difficult to start tracking but the skills can be built on throughout your life. or just possibly an otter! The pictures on this page are offered as a starting point to stimulate your interest. They are all around Cambridge except those on the snow which were North York Moors. The Animal Tracks iPhone app helps you identify that wildlife track you find as you wander along on your expedition. It features a database with 7 search-able track categories fully illustrated by size and shape for quick selection plus illustrations of both fore and hind feet, with a complete description of track measurements, gait patterns used trail widths and animal life cycles. However, its price ($6.99) may mean only avid trackers would consider it worthwhile.